Something else on your mind, Don? 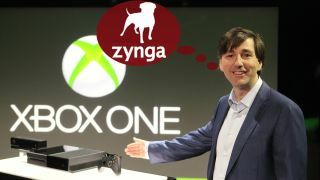 Don Mattrick's move to Zynga might have been unexpected for some, but it turns out that the Microsoft ex-boss has had his eye on the social gaming site for quite some time. Mattrick, who was President of Microsoft's Interactive Entertainment Business, had actually been in negotiations to buy Zynga from as far back as 2010, with talks between him and Zynga founder Mark Pincus going on for quite some time. Mattrick became interested in Zynga when the Facebook game movement started taking off, and saw an opportunity to bring more social games to the Xbox lineup in the hope that they'd be just as successful on the console. Things didn't pan out, however, and the conversations were ultimately fruitless for Microsoft. But it seems more certain that Mattrick had been toying with the idea of a move for quite some time, clearly enamored by Zynga's hold over generation Farmville. We can imagine Mattrick is feeling a lot better right now after a pretty hairy few weeks with the Xbox One and all its DRM controversies and U-turning. Mattrick has taken over from Pincus as CEO of Zynga, with the company hoping to reclaim its position as the number one game creator on Facebook - a title it recently lost to King.com. Pincus will remain as chairman of the board of directors and as chief product officer. In fact, both Mattrick and Pincus have apparently become pretty tight over the years, and even like to go bike-riding together. There's a nice image to brighten your Monday.